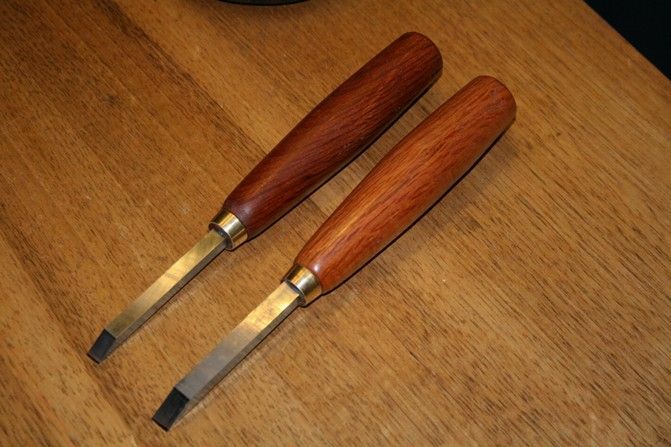 These have to be the easiest chisels to make. Everyone should have a couple. I was at the Perth Wood Show all day yesterday on Chris Vesper's stand. We had a lot of fun competing with each other cutting dovetails, trying to produce something fancy for all who passed by. The fanciest we managed were Houndstooth dovetails (off the saw). Chris is better than I am - faster - and so he should be as a professional tool maker. He is good. Hopefully I should have some photos to upload when he sends me copies (he had the camera). After a day of this I was wandering around some of the stands, and picked up a couple of cheap Chinese HSS short blanks that I thought would make great chisels. One was 1/4" wide and 5/16" deep, and the other was 5/16"wide x 5/16" deep. I imagine that these are easily available to most. The two lengths of HSS must have cost about $10 together. I was thinking about some recent posts about someone who wanted a corner chisels, and how I had written that I considered them an absolute waste of money. The chisels I have made are what I would use in place of a corner chisel. 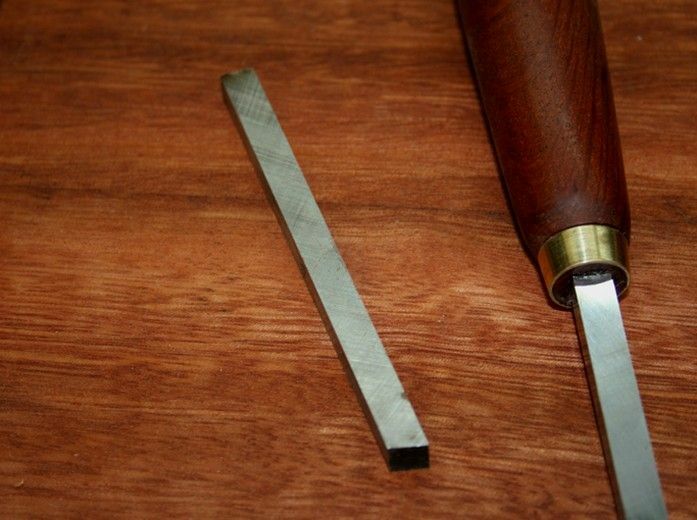 They are for squaring the end of a mortice (such as one made by a power router of just paring the end of a mortice from a mortice chisel) or the stopped end of a groove. While this can be done by a multitude of chisels - and indeed I have tended to use a oval bolstered mortice chisel - what is ideally needed is a chisel with parallel sides and deep enough to register with the sides of the groove. 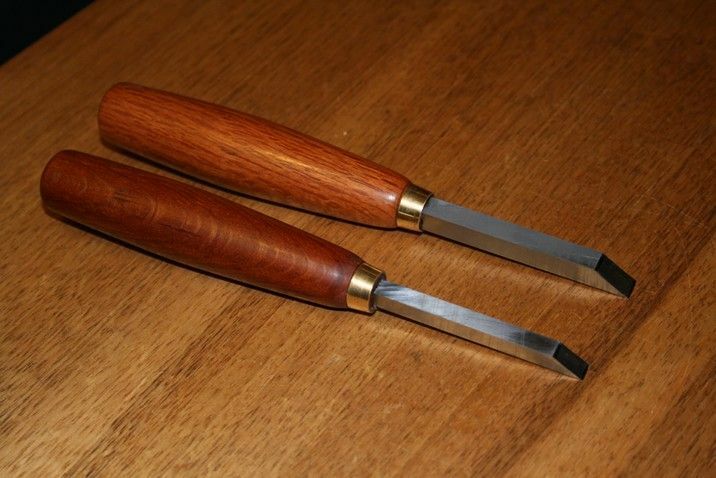 My mortice chisels have tapered sides, and my paring chisels are too thin to register in the way I described. The chisels both took under 1 hour to make. 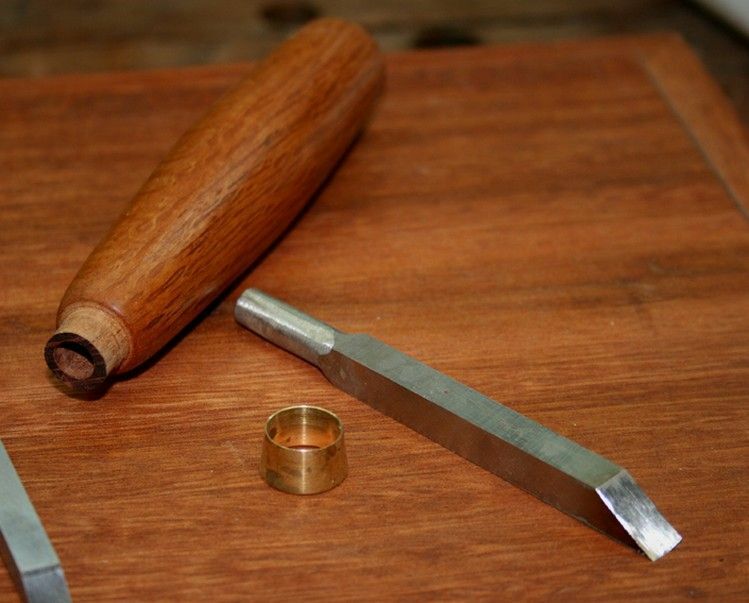 Grind the end into a round tenon freehand on the high speed grinder (an advantage of HSS is that you cannot damage the temper with the heat generated, so go mad!). Turn a handle and drill it out for the tenon. Add a brass ferrule to the mix. 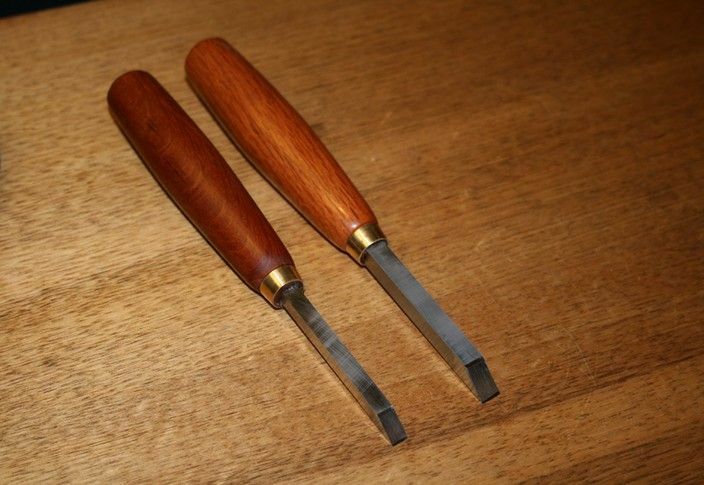 Two squaring chisels, one 1/4" and the other 5/16". Both with Sheoak handles (tough as old boots). Blades are 2 3/4" long. Short for control (deep is not needed).